Looking for last minute gift ideas for the proud rebel or misfit in your life? 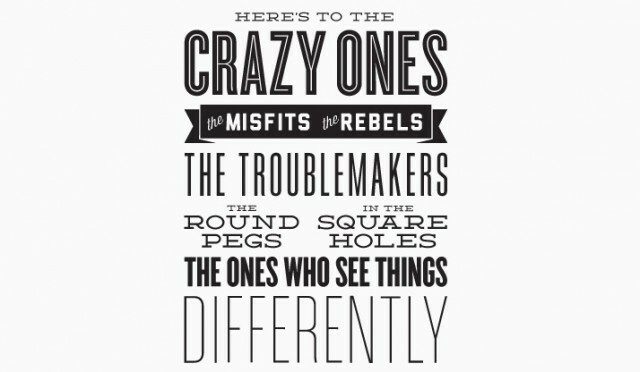 What about this beautiful letterpressed poster by Brightwurks replicates the full text of Steve Jobs’s iconic 1997 “Crazy Ones” ad, with all proceeds going to Acumen Fund, a charity that helps relieve poverty. The poster is printed on 140# paper and measures 10 inches wide by 26 inches tall. It’s stunningly beautiful, but letterpress isn’t cheap: expect to pay $95 for it unframed, or $195 framed. Full poster can be seen below.